Have you ever wondered why we practice restorative yoga? Stay with me, because in the rest of this video, I am going to explain why. As many of you probably already know, in restorative yoga we do long held passive restorative yoga postures using props. You are completely supported by the props so that you can let go and rest. So why do you need a restorative yoga practice? Why should you do it? 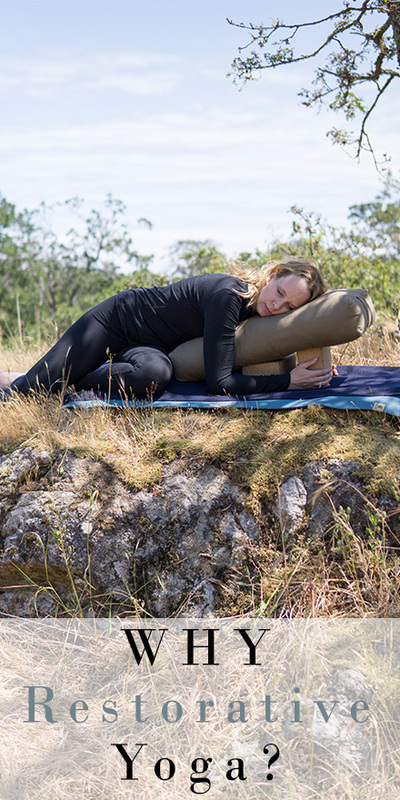 Restorative yoga offers you the opportunity for conscious relaxation as opposed to the kind of mindless relaxation that you might normally be involved in when you scroll through instagram or watch mindless television. Many yoga styles are still about doing more, accomplishing, and achieving certain yoga poses. Restorative yoga is truly about doing less. Whereas in a power yoga class class for example the effort might be in building cardiovascular or muscular strength, in a restorative yoga class, the actual effort is a willingness to look at how and where we are holding tension and to relax our body into the ground. When we are willing to release habitual and unnecessary tension in our body and minds we can soften and allow the breath to come into our bodies in a deeper way. So ultimately, the real reason why we practice restorative yoga is to explore how and where we hold tension in our bodies in order to release that tension. Whether the tension is being stored in our physical, mental or emotional bodies, the long holds in the restorative yoga classes will allow us to release the tension, stress and anxiety into the props and the ground over the length of the restorative yoga class. I have a special gift to help you release even more stress and tension today: the ultimate guide to taking a wellness yoga staycation retreat right from your home.